Empathy training is a waste of time and will have little to no effect on the customer experience in your contact center. If you want to build empathy skills in agents, you need to have the right mindset and take the right actions. Don’t waste your money on empathy training alone, do this instead. Many, if not all of these 7 elements can be found in contact centers where empathy is part of the customer experience. These do not happen by mistake, they are intentional and part of the on-going practice of the organization or the contact center itself. You may find empathy training as part of their overall practices, but you will never find it as a stand-alone method for change. They Avoid Short-term Gratification: These contact centers know that developing performance and possessing a culture where empathy resides is not the result of short-term tactics (like empathy training) or a once-and-done event or activity. They design a long-term plan that contains multiple and on-going tactical actions. When it comes to long-term strategy, that often is contradictory to the approach that is taken with contact center training. High-performing contact centers avoid this pitfall. They Leverage Their Data: The best performing contact centers leverage their operational and quality metrics in concert with their customer satisfaction scores and customer comments. They mine and interpret the data to spot indicators and trends that reveal when empathy and customer value is in jeopardy – and they act on it. They Avoid Benchmarking: High-performing contact center leaders do not waste a lot of time benchmarking their contact center performance. They strive for differentiation. They seek out the top performers in customer experience and quickly adapt the leading practices to fit their own environment and needs. Leaders in these contact centers do not forklift leading practices, they elect to quickly re- engineer practices to fit their environment and purpose. They Don’t Take on Boat Anchors: The best contact center leaders protect their speed and agility. They know that things like culture, purpose and mission must be protected because it enables agility and it’s something they must steward every day. So, they quickly cast out people and practices that will weigh these things down. In these contact centers cultural fit is most often more important than job skills or experience. They screen for fit, lead for fit and continually communicate about fit. They Implement Corporate Humility: The best realize they do not know it all. They realize that ‘knowing’ causes learning to stop. These contact centers are in continuous learning mode and refuse to settle for status quo or average. They Nurture Empathy: Leaders in high-performing contact centers go beyond reminding their people to imagine themselves in the customer’s shoes – they will image themselves being in their people’s shoes. In the Civility in America, 2018 survey, the vast majority of respondents – 93 percent – believed we have a civility problem in America; 69 percent believed it was a major problem; and this result has not changed from the 2017 survey. By all observations, incivility is bad and not improving. 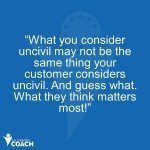 So why is incivility getting worse towards customers? One factor is globalization – agents from one culture sometimes unknowingly behave or speak in ways that customers from other cultures find rude. When taking a dishwasher example in India, for example, they are not common and not native to their society. In the US, a large portion of the population have them and heavily rely on them. If an agent is talking to a customer in the US, how can you expect them to empathize with the customer if they have never experienced a dishwasher? 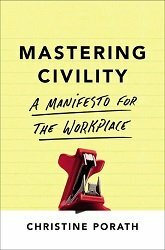 Or consider the experience Dr. Porath shares in her book Mastering Civility: A Manifesto for the Workplace, about her mentor, Ed Lawler, director of the Center for Effective Organizations at the University of Southern California. Years ago, he gave a talk to a group of students in a large auditorium in South Africa. He couldn’t figure out why he was putting everyone to sleep. The students had their heads down the entire time. No eye contact, no friendly nods, no smiles—nothing. Only later did he learn that this gesture – the bowing of the head – signified an immense respect for him. Another factor is generation. Research conducted by Jean Twenge, professor at San Diego State University, revealed results that show that students are about 30 percent more narcissistic than the average students were twenty-five years ago. When you’re excessively focused on yourself, you’re going to be that much less concerned about the effects of your behavior on customers. And in one study, more than half claimed they were uncivil because they are overloaded, and more than 40 percent said they had no time to be nice. A quarter said they were rude because their leaders were disrespectful. Another quarter reported that their companies lacked guidelines or training about how to treat people. Dr. Porath reports that one of her biggest takeaways over the past couple of decades is that incivility and the lack of empathy usually arises not from malice but from ignorance. When she started her research, she perceived that jerks out there were intentionally ruining workplaces; she now sees that most bad behavior reflects a lack of self-awareness. We don’t want to hurt others or offend customers, but we do. We’re oblivious—and behaving in ways that we would never want to be treated. Employee commitment – to the company, the product/service value proposition, customers, and fellow employees – is a hallmark of stakeholder-centric cultures and processes. As you’ve described so well, empathy training is a band-aid, not major surgery if customer value delivery is MIA. In books like Firms of Endearment, Conscious Capitalism, and The Customer Comes Second, the linkage of customer and employee experience shows that each stakeholder group can win if they are committed to success. 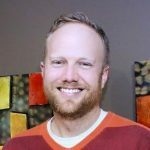 Thanks Michael, in over three years of podcasting on the Fast Leader Show (https://www.fastleader.net) I’ve heard what must be hundreds of linkages and connections to emotional intelligence, culture, leadership, customer experience, growth, communication, transformation, and so much more on this. The interesting point is – all of this is global and universal. And no one is immune. The human struggle is ever present inside, outside and all around – what we do and how we lead ourselves and others is the legacy we live and leave. I love the holistic approach to empathy here, Jim! Totally agree.